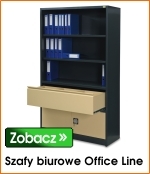 Classic Line office furniture are an excellent solution for furnishing offices and studies. Cabinets are ideal for files, records and documentation storage. Calssic Line office furniture are powder couted in RAL colours from standard RAL palette. More about the colours of our furniture can be found in the Client zone. When making the purchase decision an important role take warranty conditions, therefore all Classic Line office furniture are covered by 2-year warranty.